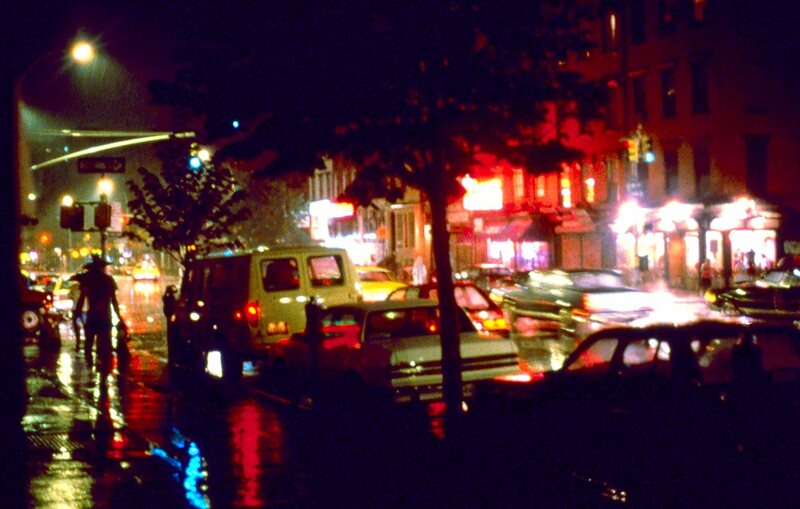 This photo was from a series I shot around in connection with a piece I wrote called Everything Must Go.It was about the rapidly changing nature of the East Village in the mid-80s. It was a multimedia piece, there was a play at the heart of it, but I wanted to combine other elements: music, and photos such as the one above which were going to be projected. I had a good director lined up (Kate Baggott, who worked with the Ensemble Studio Theater), and we were all set to do it at University of The Streets on Avenue A, when a piano mysteriously appeared on stage. They refused to remove the piano. That made it a no go. I literally had the contract in hand , but luckily never signed it. I shot a lot at night because the colors and mood were right for the piece. Ektachrome was an amazing film for low light, because of what happened when you pushed it in the developing process. This picture is called “Leafman” because of the fellow on the left side of the screen. He was always covered in recently alive tree branches, which he fastened over his regular clothing. I used to run into him walking down First Avenue and around Tompkins Square Park. Nowadays, you don’t run into folks like the Leafman much in the East Village. It was clear to me when I took the picture that his days were numbered. Change was coming and a lot of people would be lost in its wake. That was the story I was trying to tell in Everything Must Go.